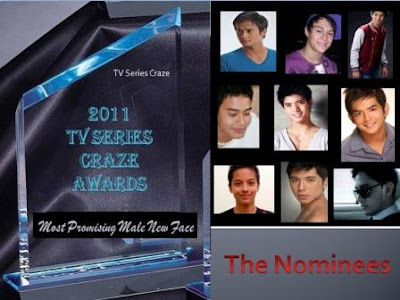 The 2011 TV Series Craze Awards: "Most Promising Male New Face" Nominees! Hot, young, fresh! They were the male young heartthrobs who always put 'kilig' in our everyday TV series viewing. This 2011 is their year! Yup, all of them were launched or introduced in the different top rating teleseryes! 9 hot young men captured our hearts! 9 fresh male faces caught our attention! But only one of them will be given the title of the 2011 "Most Promising Male New Face." To vote for the most promising new male face of your dream, one is vote through this website in our voting area in the right side panel. Then the other one is through our Facebook Fan Page. In our Facebook Fan Page, kindly like our page if you're not yet a fan then locate the album of the nominees. Just click "LIKE" in the picture of your choice. Here is the album of the nominees where you can cast your votes: VOTE HERE.